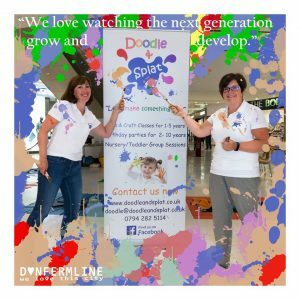 Doodle & Splat has been running in Fife for over 10 years providing arts, crafts & Messy play to children from 6mths old, as well as craft events for adults. 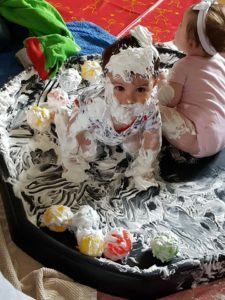 6mths to 5 years in our fun packed mult i-sensory Messy Splatter sessions which run for 1 hour, where there will be lots and lots of activities for everyone to explore where they can pour, squeeze, squelch, mix and paint. Children will use all their senses in the process of exploration, as well as developing hand eye coordination and fine motor skills. There is no right or wrong way to play, it’s all about having fun! 1 to 5 years in our Arty Doodler session which have a mixture of planned, simple, art activities as well a wide selection of imaginative play activities including, sensory trays, homemade play doh, chalk boards, paint dabbers – the list goes on! These sessions offer children the opportunity to try out new activities, use their imaginative and build confidence as well as having LOTS of fun!! Arty Doodlers are starting in Viewfield Baptist Church, Dunfermline on MONDAY 13th MAY at 10am. This is a lovely central venue with easy access to car parks & bus links. Tickets are now available to book. Doodle & Splat is coming to Glenrothes! We are very excited to be starting both Messy Splatter Sessions (6mths+) and Arty Doodler sessions (1 yr+) and in the fantastic Studio 8 in Glenrothes. This is a fantastic, central venue, with lots of space. The next session is on Monday 1st April. 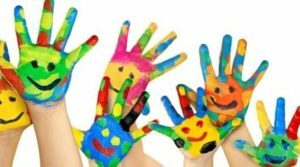 Mon 13th May at 10am Arty Doodler Session (1-5yrs) at Viewfield Baptist Church, Dunfermline – click here to book NEW VENUE! Doodle & Splat Doodle & Splat shared an album: Mercat Easter Fun! Easter holidays are coming to an end but don't despair we have lots of Arty Doodler & Messy Splatters running next week! Doodle & Splat Doodle & Splat shared a post. Doodle & Splat Doodle & Splat shared a photo.